Standard Gold in China is bullion cast by a LBMA or SGE approved refinery in the form of bars or ingots of 50 gram, 100 gram, 1 kilogram, 3 kilogram or 12.5 kilogram form, with a fineness (gold purity) of 9999, 9995, 999 or 995. Both Standard Gold and Non-Standard Gold are exempt from VAT when imported into China by authorized gold importers. The default rate of Value Added TAX (VAT) in China is 17%. However, various lower rates also exist. Standard Gold sold on the Shanghai Gold Exchange (SGE) is VAT exempt. A party to a gold transaction on the SGE will be issued with a “SGE Invoice”. China’s current Value Added Tax (VAT) system was established in 1994. In 2016, the Chinese government moved to make VAT the only indirect taxation system in the country by fully eliminating a legacy Business Tax (BT). In China, VAT is chargeable on the sale of goods, provision of processing and repair services, and the importation of goods. The standard VAT rate is 17%. Apart from the standard 17% VAT rate, there are various lower VAT rates in China such as 13%, 11% and 6%. However, these rates only apply to certain categories of goods. For example, financial services are charged at a 6% VAT rate, postal services are charged at 11% VAT, and newspapers, books and magazines at 13%. All other taxable goods and supply of services are charged at 17%. Prices in China are normally quoted with the applicable VAT included. Note that all prices quoted on the Shanghai Gold Exchange (SGE), Shanghai Futures Exchange (SHFE), Dalian Commodity Exchange, and Zhenzhou Commodity Exchange are quoted as VAT-inclusive prices. VAT is collected and submitted to the Chinese tax authorities by “VAT-liable entities”, which are defined as either General VAT taxpayers or Small-scale VAT taxpayers. General VAT taxpayers are large firms that meet certain threshold annual sales and have an ability to maintain an accounting system sophisticated enough to accurately calculate output VAT and input VAT. Small-scale VAT taxpayers are businesses with an annual turnover of less than RMB 5 million that have not registered as General VAT taxpayers. Small-scale VAT taxpayers pay output VAT (see below) at a 3% VAT rate. From the perspective of an intermediary, such as a wholesaler enterprise which buys goods and then resells them, output VAT is charged by the wholesaler’s supplier and billed to the wholesaler, while input VAT is charged by the wholesaler to its downstream customers. As with all VAT systems, VAT invoices are needed if offsetting output VAT against Input VAT. In order for Input VAT to be used as a tax credit to offset an Output VAT liability, the Input VAT must be substantiated by either a “Special VAT Invoice (SVI)” or a “Customs Office Special Receipt for the payment of import VAT”. 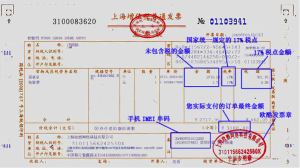 Click to Enlarge – Exhibit 1, Special VAT invoice (SVI): 上海增值税专用发票 Shanghai SVI, 开票日期 Invoice issuance date, 购买方 Purchaser, 名称 Name, 纳税人识别号 Taxpayer code, 地址，电话 Address, telephone, 开户行及帐号 Bank & bank account number, 密码区 Secret code area, 货物，应税劳务及服务 Goods, taxable labour and services, 规格型号 Type, 单位 Unit, 数量 Quantity, 单价 Unit Price, 金额 Amount, 税率 VAT Rate, 税额 VAT amount, 合计 Total, 价税合计（大写）Sum of price and VAT (in traditional Chinese characters), 小写 In Arabic numbers, 销售方 Seller, 备注 Note, 收款人 Payee, 复核人 Double-checked by, 开票人 Invoice issuer. When a Chinese company imports goods, it is required to pay VAT to the Chinese Customs Office. The Customs Office will issue a “Customs Office Special Receipt for the payment of import VAT” to the company, which can then be used as a VAT invoice. 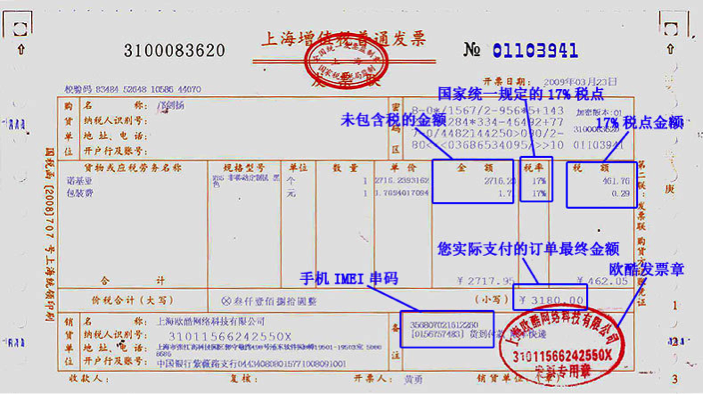 The final type of VAT invoice is a “Shanghai Gold Exchange Invoice (SGE Invoice)“. The SGE Invoice is designed and issued by the SGE under the supervision of the national tax authority. In China, authorities classify physical gold as either ‘Gold’, ‘Gold Products’ or ‘Gold Ore’. ‘Gold’ refers to unwrought/unforged gold, such as gold bars gold and ingots, and can be sub-divided into Standard gold and Non-standard gold. Standard gold refers to gold bars or ingots having a fineness of 9999, 9995, 999 or 995, and a weight of 50 gram, 100 gram, 1 kilogram, 3 kilograms or 12.5 kilograms. Only Standard gold is traded on the SGE and the Shanghai Futures Exchange (SHFE). Non-standard gold includes any gold that does not satisfy Standard gold criteria, for example 200 gram gold ingots. ‘Gold Products’ refer to semi-finished gold and finished products of gold, such as gold coins, gold jewellery and gold ornaments. ‘Gold Ore’ is, as the name suggests, gold-laden ore extracted during mining. Standard gold and Non-standard gold imported into the Chinese domestic market are VAT exempt if imported by entities that hold a gold import license from the Chinese central bank. Click to Enlarge – Exhibit 3: VAT rates in the Chinese domestic gold market – rates dependent on type of gold, and can differ from 17 %. If gold producers and gold traders (general VAT taxpayers and small scale VAT payers) sell Non-standard gold off the SGE (off-exchange), it is VAT exempt. If gold producers and gold traders sell Standard gold off the SGE or off the Shanghai Futures Exchange (off-exchange), it is liable to a 17 % VAT tax rate. If Standard gold is sold on the SGE or on the Shanghai Futures Exchange, it is VAT exempt. ICBC imports a 1 kilogram Au99.99 (SGE 1 Kg 9999) gold ingot from Switzerland at a price of 230 CNY/gram (approximately 1,033 USD/oz). This gold ingot is Standard gold. ICBC further sells this gold on the SGE bourse at a price of 234 CNY/gram. Guangdong-based gold jewellery manufacturer Shenzhen Batar buys this gold from ICBC, i.e. Shenzhen Batar is counterparty to the ICBC sell transaction. ICBC: When ICBC imports the kilogram gold ingots, it receives a “customs office special receipt for the payment of import VAT”. 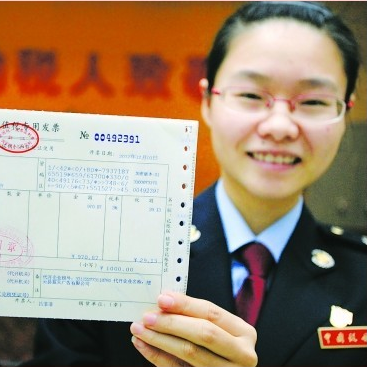 On this receipt, the total VAT-exclusive amount for the gold is 230,000 CNY and the VAT is zero (ICBC’s Input VAT). This is because imported standard gold is VAT exempt. When ICBC sells the gold for 234 CNY/gram on the SGE, it needs to issue a general VAT invoice to the SGE, on which is recorded 234,000 CNY for the gold and 0 for the VAT (ICBC’s Output VAT). This is because selling Standard gold on the SGE is also exempt from VAT. Upon issuing the general VAT invoice, ICBC will receive an SGE invoice from the exchange. To understand the reasoning behind this calculation, note that upon withdrawal, this standard gold exits a VAT exempt environment (the SGE system) and enters an environment which is not exempt from VAT. Hence, VAT is applied. 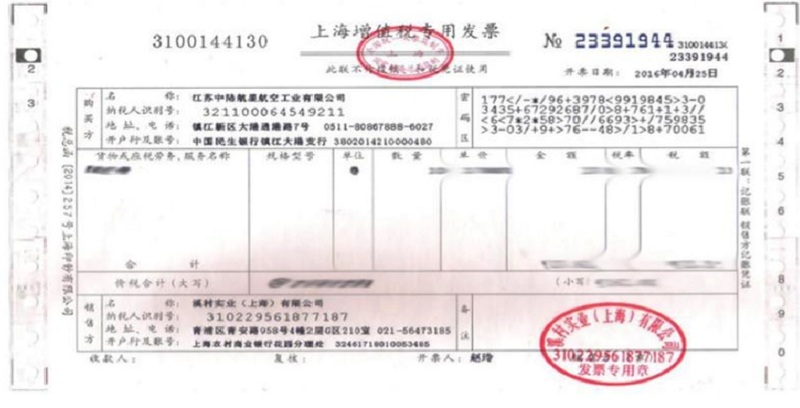 In the scenario under which Shenzhen Batar does not withdraw the gold from the SGE, the SGE invoice is the only invoice it will receive for accounting purposes. If Shenzhen Batar does withdraws the gold, an SVI is issued because the standard gold withdrawn can be manufactured into new gold products and sold off-SGE. Therefore, Shenzhen Batar will need to claim Input VAT. General VAT taxpayers that withdraw from the SGE will receive a SVI, while individuals that withdraw from the SGE will not. The input VAT noted on Shenzhen Batar’s SVI from the SGE is not an amount that Shenzhen Batar paid to ICBC as VAT, but Shenzhen Batar is allowed to deduct this amount from its Output VAT. Shenzhen Batar: After concluding the purchase of 1 kilogram 9999 gold on the SGE at the price of 234 CNY/gram, Shenzhen Batar receives an SGE Invoice, and also receives an SVI after it withdraws the gold from the SGE. 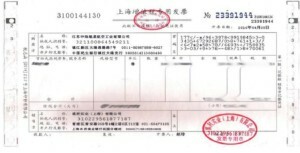 The input VAT is 34000 CNY – described above. Shenzhen Batar then fabricates and sells all the gold ornaments made from the 1 kilogram of gold at the VAT-exclusive price of 300 CNY/gram. Therefore the output VAT is 51000 CNY. Therefore, the VAT payable for Shenzhen Batar is 17000 CNY. Since Shenzhen Batar now holds the SVI from the SGE, the Chinese tax authority will accept the 34000 CNY input VAT as a tax credit to to offset against the Output VAT.